When you want something quick but yet healthy for dinner, this fits the bill perfectly! And to cut out on carbs, you can serve this over a cauliflower mash instead of potatoes ! Blot the salmon filets with paper towel to remove all moisture from the surface then place skin side down on a lined baking sheet. In a small bowl, stir together all the above ingredients except for the spring onions, until well combined. Spread the glaze over the top of the salmon in an even layer. Put the salmon in the oven and cook for 10 minutes approximately, depending on the thickness of the salmon. The standard rule of thumb is to cook for 10 minutes per inch of thickness which is measured from the salmon’s thickest point. Take out of the oven, garnish with the spring onions, drizzle with any leftover glaze and serve. 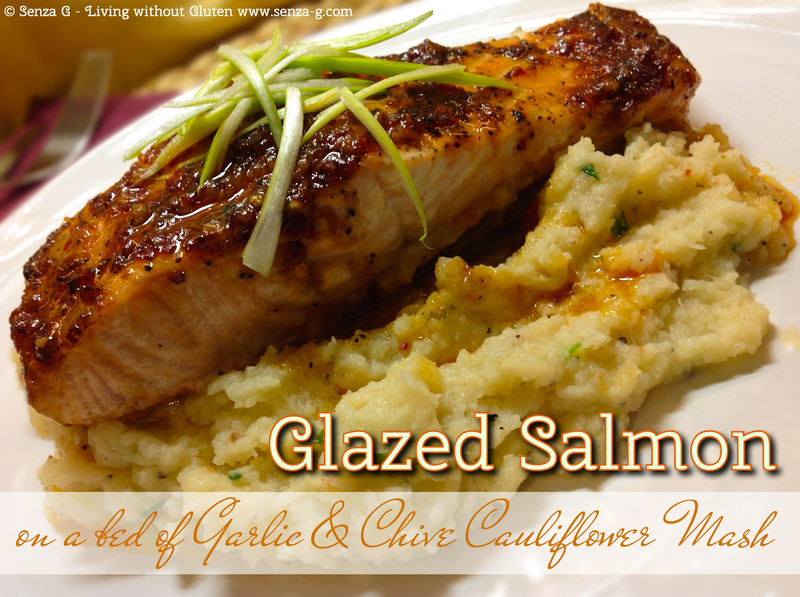 I served mine with a garlic and chive cauliflower mash. Made simply by boiling cauliflower florets from a large cauliflower, with 3 or 4 peeled garlic cloves. When soft, add two to three tbsp butter and 1/4 cup parmesan, 2tbsp chopped chives and mash well. You can also add some cream if you wish it creamier.